Fuchsia is a large and diverse group of plants that includes some of the most beloved shade species and hanging basket specimens. They have very exacting growing requirements, but the stunning blossoms are well worth the effort. For the most part fuchsias originate in mountainous regions of the subtropics, meaning they are not very cold hardy, but they also need relatively cool daytime temperatures to thrive - which is not a common combination of climatic characteristics, hence the challenge in growing them. That being said, plant breeders have done amazing things with the fuchsia genus, creating stunning hybrids that can be grown reliably in most areas of the country, as long as they are properly cared for. Fuchsias are known for their pendulous, tubular blossoms, often occurring in the color that was named after the plant. However, their form ranges from compact perennials to large shrubs and flower size ranges from a half inch to three inches across. In areas where winter temperatures stay above freezing, all fuchsias can be grown as evergreen perennials, though there are some varieties that will tolerate colder weather. Fuchsia is not frost hardy, other than a few noted exceptions below, so most gardeners grow it in a pot. The most popular varieties have drooping branches, making them ideal to display in a hanging basket. The flowers are notorious for attracting hummingbirds, so placing a hanging basket with fuchsia in front of your window is a great way to see these magical creatures up close. 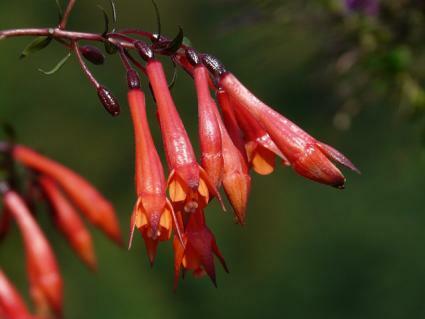 However, make sure they have shade - fuchsias can take some morning sun, but will be scalded by hot afternoon sun; filtered or indirect light is best. 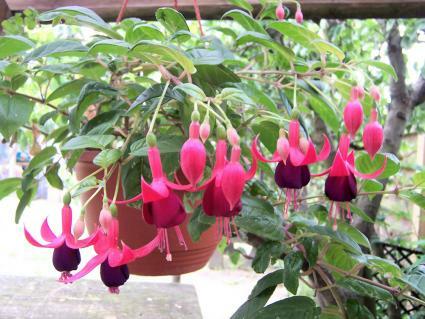 There are other reasons for growing fuchsia in pots. They have very demanding soil requirements - namely, they need perfect drainage, high organic matter content, readily available nutrients and slightly acidic pH - which a lightweight potting mix can provide. Pot them up in spring as soon as they become available in nurseries for a season long display of nectar-rich flowers. Fuchsias can also be planted in the ground in raised beds that have been thoroughly enriched with compost and grown along with other cool season annuals. In the climates where they grow successfully, the larger shrubby fuchsias can be used like any other evergreen hedge, though again, the soil should be carefully prepared. Potted fuchsias may need water on a daily basis in summer, as it is critical that the soil not become completely dry. In the ground, a layer of mulch over the roots will help conserve moisture, but be vigilant for the first signs of drought stress and irrigate abundantly when needed. Some gardeners even spritz their fuchsia plants daily to help provide the cool, humid conditions they prefer. 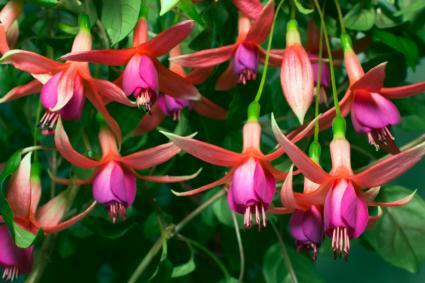 Fertilizer is more important for fuchsias than most plants, especially the stunning hybrids sold as potted specimens. Plan to give them dilute liquid fertilizer every three to four weeks or slow release fertilizer pellets every two to three months. Besides the shrubby varieties and those grown in hanging baskets, most fuchsias will need to be staked to prevent their flexible, flower-laden stems from flopping to the ground. They often come with a stake in their pot, but you may need to provide additional staking as they grow. A lightweight wood, bamboo or synthetic pole is sufficient. Use flexible plastic plant tape for best results when tying the fragile stems to the stakes. There are numerous insects and pathogens that attack fuchsia plants, but bear in mind that they don't do well in hot climates to begin with, so if they start looking poor with the first heat wave of summer, weather is more likely the cause of their distress. In hot climates, fuchsia is largely restricted to use as a spring annual for this reason. Likewise, healthy fuchsia plants may look shabby when cold weather approaches in fall. Fungal pests, such as rust and powdery mildew, often affect the leaves; both can be treated with fungicides, though not always successfully, especially if the growing conditions are inadequate. If aphids appear, try spraying them with an insecticidal soap. The other pests and diseases that affects fuchsias are difficult to treat and are best avoided by trying to provide the best possible growing conditions that support healthy plants. Finding the right fuchsia depends on your climate and your reason for growing them. Trailing fuchsias are best for hanging baskets. Taffeta Bow has flowers in the classic fuchsia color with layers and layers of lush petals. 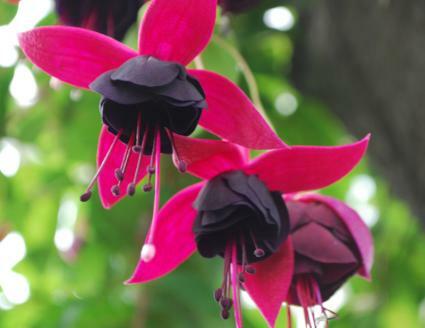 Black to the Fuchsia is a striking variety bearing flowers with a dark center and contrasting crimson petals. Mood Indigo has double pinkish-white petals and a magenta center. Eternal Flame has double rose and orange flowers. Buttercup is a white and orange variety. Gartenmeister Bonstedt is a shrub up to three feet tall with three-inch tubular blossoms that tolerates temperatures down to 20 degrees. Kiwi Sheen is hardy down to 10 degrees and grows up to 10 feet tall with deep purple foliage and half inch burgundy flowers. One little known fact about fuchsias is that the flowers are edible. They don't taste like much, but if you have an abundance in the garden, they are great way to garnish a special meal.